Here is your second Rockport fishing report for the month of April. It’s finally feeling like Spring around here. April has not disappointed, for those out here on the Texas flats. The weather has improved. The fishing is improving. And all things are looking up for the month of April. The past week or so has been pretty good around the Texas Coast. Our weather is finally acting a bit more normal. Daytime temps are in the 80 degree zone, which is about right. Winds have been pretty manageable, for the most part. Maybe even a bit better than average for this time of year? But not too bad, regardless. So we have had boats out on the water every day so far this month. Over the past week, we’ve had consistently high’ish water. Nothing too crazy, but a bit on the high side. Actually, fairly normal for Spring around here. We’ve also had some fairly large tidal movements as well. So this has made the fish pretty happy as well. Low tide early morning, with a strong in coming all day is about perfect for what we are trying to out there. Especially if you are looking to play with some of migratory fish. And on that note… With the warming water, and strong incoming tides, we’ve started to see a good number of our migratory species around. It always starts with the big schools of rays moving across the flats. Then you’ll start see skipjacks and other stuff in the shallows. Then, it’s time to start checking the deeper water for schools of jacks and whatever else swims by. So this week has been perfect for the jack fishing. We’ve had a few very calm days, with warm temps and perfect tides. This led to a couple days of very good jack fishing for our clients. Most days, we are getting a good handful of shots at fish crashing on the surface, in the couple of early morning hours we are spending looking for them. As the sun gets higher, and the fish go deeper, we will move on to our shallow flats in search of reds. But the jacks are here in big numbers and are pretty easy targets, on the right weather days. The reds are finally beginning to act a bit better for us as well. This week has been outstanding, fishing wise. Late last week or weekend, the fishing was still just so so. On the verge of being good, but still far from great. Finally, after a warm and calm day on Monday, things seemed to shape up pretty quickly. Since then, we’ve had a very good week on the flats. The fish are moving around from sun up to sun down. Tails, schools and crashing fish are all common place each day. Most are very happy, and willing to eat a well presented fly. That being said, on some of the very calm days, we have had some very finicky fish. But that is to be expected. But most are more than willing to eat a fly. Some have been very receptive to a topwater fly as well. Last weekend, we had a very good day on the surface in the Port O’Connor area. Our flies have been a bit all over the place this week. Capt. Gibson is throwing a smaller shrimpy looking fly with great success. Capt Jeff is throwing darker crab or toad patterns for most of the day. A pink Chug Bug or pink/white Tube Top has been the favorite topwater offering. For the jacks, we’ve had a black crab eaten. But Capt. Jeff has had his Squid Vicious fly picked up very easily for those fish not on the surface. If they are chasing bait to the surface, the large red/white Tube Top is the way to go for sure. We expect the fishing to continue to be very good, and even improve, as this week goes on. The weather is looking really good out there, and will continue to get that water to the temps these fish enjoy. So the redfishing should continue to get better and better. The jacks will remain around and very catchable, under the right conditions. We did hear reports of the first tarpon showing up just offshore, although we have not seen anything with our own eyes just yet. But based on the number of jacks, pompano and sharks around, that doesn’t really surprise us. We will keep you up to speed on that. Other than that, it’s busy busy around here. We have boats running all over the place every day this month. This will continue on through the Spring and until the heat of Summer sets in. But if you are looking to get out on the water, you can always contact us any time if you would like to BOOK A TRIP or need any up to the minute Southwest Texas fly fishing or Rockport fishing type news. We continue to post on Instagram, Facebook, Twitter and Snapchat. Or perhaps SUBSCRIBE to our YouTube Channel as well. We continually are trying to add more videos and stuff there. 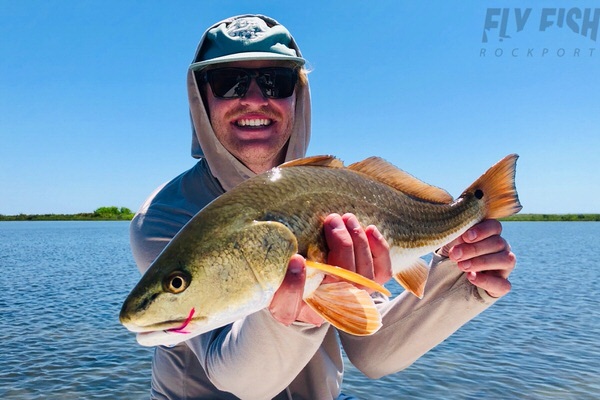 We try to keep stuff fresh for those of you that are wishing you were on the flats with us. So be sure to follow us on all our social media stuff. And don’t forget to sign up for our monthly newsletter below.